How long is a railway station platform? 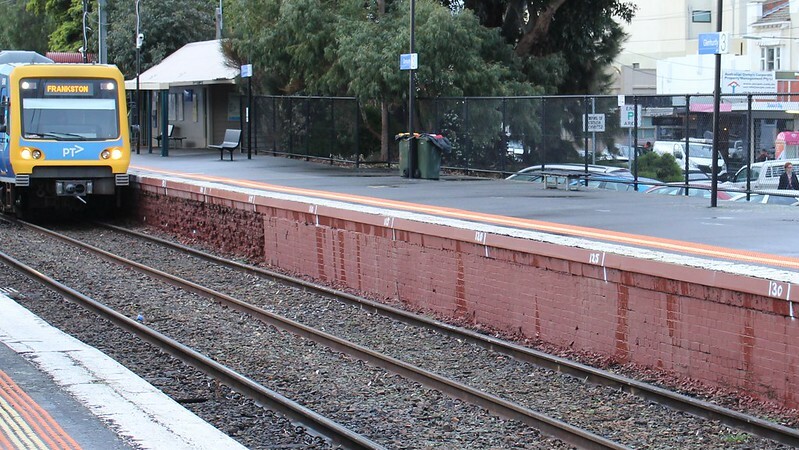 Last Monday’s meltdown soured the return of trains after upgrades on the Dandenong and Frankston lines – which included works for the Metro tunnel, and also power upgrades extensions to some platforms. 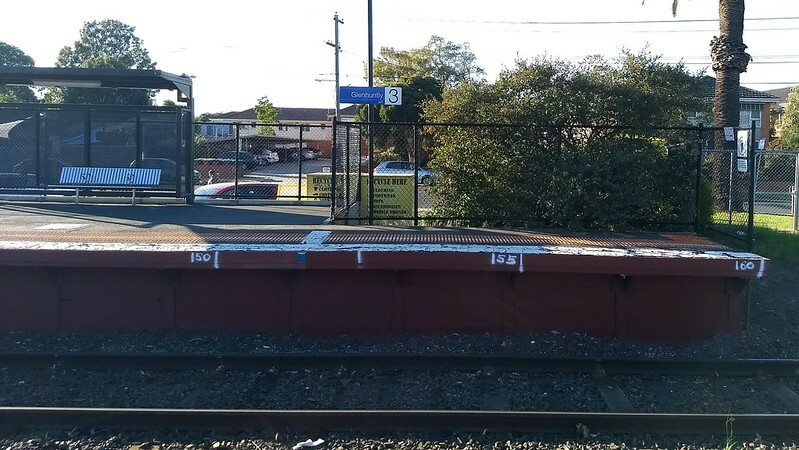 So, how long is a railway station platform? Generally, as long as the trains that serve it, plus a bit for spare. There are exceptions, especially in regional areas of some countries, though this is rare in Victoria. As early as 1908, and probably taking into account existing platform lengths, planning work for electrification determined that trains would be up to 6 carriages x 17.4 metres — the Tait (red) trains were built to this about length too. Some then-existing shorter swing-door carriages were extended to that length, with trains being steam-hauled until each line was electrified. Information I’ve found is a little vague, but I believe with buffers/couplings the total carriage length was 18.81 metres, making a 6-car (electric) train 112.86 metres long. Prior to that, trains had been various lengths, and the standardisation of lengths led to some lines getting more powerful steam locos, to cope with the additional weight, particularly on the hillier lines such as Ringwood and Hurstbridge. In the 1920s, after electrification was completed, crowding resulted in extra carriages being added, making 7-car trains = 131.67 metres, requiring some platform extensions. From 1967, some of the busiest lines ran as 8-cars during peak, to relieve crowding. I’m unclear of the precise carriages used in 8-car formations, but it would have meant trains at least around 154 metres long. This necessitated some platform extensions. From the 1970s, Hitachi trains were introduced, with longer carriages 23.41 metres long, of up to 6 cars = 140.46 metres, just slightly shorter than the current fleet. The 1980s saw the 4D (double-deck) train trial. This was 4 x 20.32 metres = 81.28 metres, but if they’d ever got expanded to 8 cars, that would have been 162.56 metres. But in actual fact only 4 cars were ever built, and in peak they were connected to a 3-car Comeng set = 153.28 metres. It was decided they were unsuitable for Melbourne, and the cars were scrapped. Still, the City Loop had been built to cater for a possible future roll-out of double-deck trains – both tunnel sizes, and platform lengths of about 160 metres. It wouldn’t surprise me if this was based on the standard Sydney double-deck train lengths of the 1960s, when the Loop was being designed. Platform lengths grew with the train lengths, and at some stations it’s not hard to see how they’ve been extended over the years. Today, new platforms are built as 160 metres, with the older existing platforms measuring around 150-160 metres, while most current trains are about 144 metres long. In some spots, you can see where they’ve been measuring platforms to verify the length. And what about the future “High Capacity Metro Trains” (known as HCMTs for short – I think perhaps they need a snappier name). These are expected in service in 2019? In their initial 7-car formation, these will be about 160 metres long. IT’S HAUL GOOD: The first High Capacity Metro Train was successfully hauled from Newport to Pakenham East for further testing. With that length, they will just fit into the City Loop platforms, possibly with the rear cab out in the tunnel. Part of the upgrade works underway to accommodate the new trains is improved power supply, facilitating not just the longer trains, but also more of them, with good reliability and enough juice that they can accelerate quickly. It was part of this that failed so spectacularly last Monday afternoon. Extensions to some platforms have been needed. 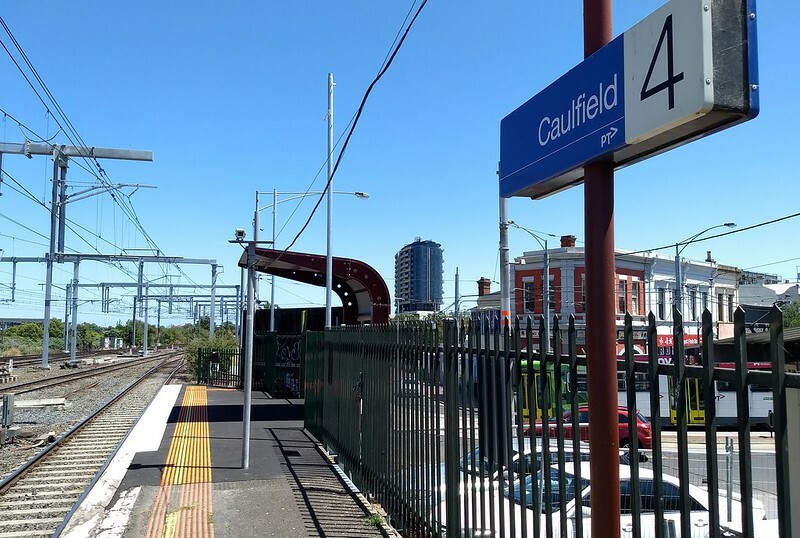 South Yarra platform 6 and Caulfield platform 4 occurred last year. During the early January works, South Yarra 5 and Caulfield 3 were also extended, though these don’t appear to be complete yet – at Caulfield there are still poles and signals in the way. I haven’t gone looking recently, but presumably extensions are also underway at other older stations that need them between Caulfield and Cranbourne/Pakenham. In the future, the plan is to later go to 10-car HCMTs – about 230m long – on the Cranbourne/Pakenham to Sunbury line, via the new metro tunnel post-2025. Because underground platforms are very difficult to alter later, the tunnel stations are being designed with this in mind. 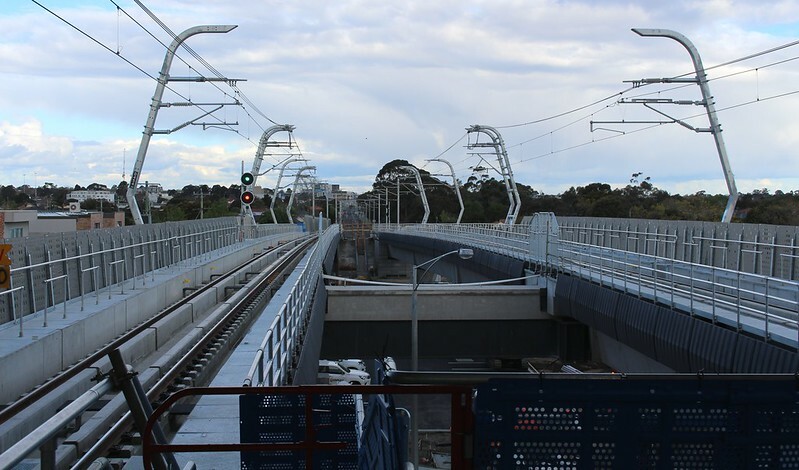 The newest skyrail stations have been built to 160m, but the LXRA tells me they have provision for 230m later, with straight sections beyond the current platforms, signal placements chosen carefully, and piers and foundations built so the new sections of platform can be slotted in with minimal disruption. Older stations will no doubt be a lot trickier. 7-cars with the existing fleet? I saw an idea proposed on Twitter: could they re-marshall the existing Comeng, X’Trapolis or Siemens fleet into 7-car trains? It’s an interesting idea. But even assuming they’d have enough power (6-car Comeng trains for instance have four motor cars), they’d be at least 168 metres – too long for the City Loop platforms, which would be near-impossible to extend. It would also cause problems in stabling yards, which would need re-design or alteration to cope with longer trains. This is why the HCMTs are getting a new maintenance and stabling facility near Pakenham. Lots of lines have crowding, and it appears all new station construction (such as the Mernda extension and other level crossing projects) has sensibly planned for 160 metres. So perhaps we can expect 7-car HCMTs eventually across the network. But it involves some big changes, so don’t hold your breath. Melbourne’s got busier, and is continuing to grow. We need all of this. Bring it on. *Note that lengths for some models of train have varied, and the information I’ve found can be a little unclear as to whether measurements are rounded, and whether they include buffers/couplings and so on which would contribute to the total length of a train. So treat the above figures as a rough guide. Any corrections? Please let me know! The swing door and tait cars were built on standard underframes, but several slightly different lengths were used. 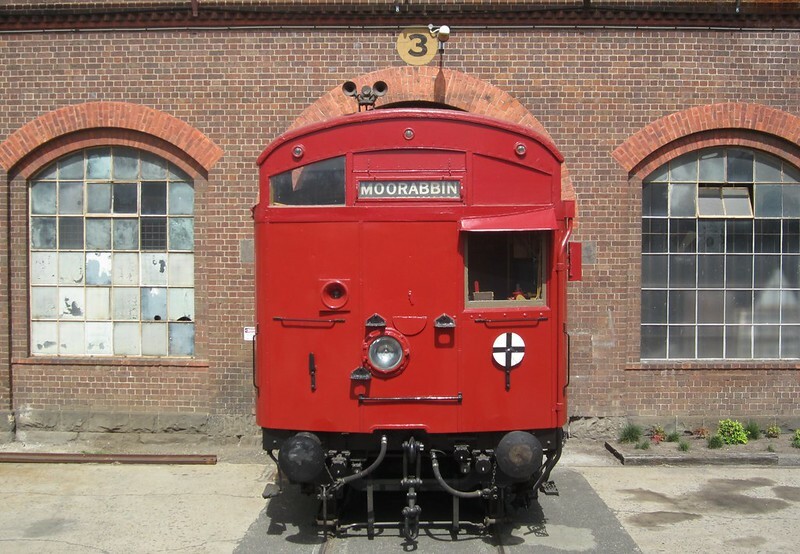 The swing door (extended) motor cars and driving trailers were 60′ 1.25″ (18.32m) or 61’8″ (18.80m) over buffers. The trailers were 59′ 3.5″ (18.07m) over buffers. The Tait (built new) motor cars were 61’8″ (18.80m) over buffers, the driving trailers were 61’6″ (18.75m) over buffers, and the trailers were 59 3.5″ (18.07m) over buffers. Platform 1 at Essendon could do with an upgrade. I know it’s getting one with the Metro Tunnel, but it would probably only require a small extension of a couple of metres on either side, plus a few Myki readers. This would allow for a lot more flexibility. To me, longer or double-deck rolling-stock isn’t the solution. While I have no issues with expanding the capacity, it needs to be a long term solution which sees improvements in signalling and infrastructure, the procurement of even more rolling-stock and the training of more new drivers to bring about a much higher frequency service. Doubling the frequency of some lines would see twice the capacity easily to emulate those of proper metros. However, change won’t be coming overnight, realistically. Driverless trains also improves network capacity…. X’trapolis trains are our current longest trains. The cars are not of even length. The M cars are longer than the T cars. V/Line conductors still routinely advise passengers to make sure there’s a platform available before alighting from the train (and specifically to mind the gap at some stations such as Little River). Which platforms on the V/Line network are too short? I think there’s at least one on the Shepparton line – Nagambie or Murchison East perhaps? And of course a train too long for the platform was a contributing factor in the rail disaster at Sunshine in 1908. @Arfman, the extra capacity is needed at peak times; doubling the number of services during peak just isn’t possible under the current network. Even with high capacity signalling and better network segregation, it isn’t realistic to run more that about 30 trains per hour so the only way to further increase the capacity of a line beyond that is by increasing the crush load of the rolling stock. @Steve, I believe they’re in the process of upgrading the whole VLine network to support future 4-car VLocity trains, including by increasing station length in places that need it. Completely agree with what you say. Such changes need a lot of investment and time into it. However 30 tph is still pretty good compared to what we have. The City Loop is running close to this capacity if I am not mistaken, so definitely further improvement to detangling the network and level crossing removals is crucial. At the moment I believe the biggest bottleneck (other than the number of rollingstock available) is the number of drivers we have hence why the government is looking more at increasing capacity of each rollingstock. If it’s any help for comparison, the Sydney Metro platforms are being built at 170 metres, which means that each car in the maximum train consist of 8 cars would be about 22 m long. However, the critical feature complementing this is that the system is capable of constant 2 minute headways, which would provide a capacity of over 40,000 people per hour per direction. This is the sort of capacity that is deemed necessary for Sydney’s future population growth, which will be pretty identical to Melbourne’s growth over the next few decades. When you consider that both cities are expected to have, within a few decades, the equivalent of the present population of New York City, this means that transport planners need to aim very high on capacity. @Rick, I think we have to assume for the foreseeable future that drivers may need to hop out to give assistance to mobility-impaired passengers. There is nothing to stop us operating existing trains in a tripple consist, except for platform lengths. Re Rick: :Like the E class trams. There are no doors at the end of the passenger saloon. Even if we do what London Underground are now doing, and just have the doors not open at platforms of which are not long enough.